"If governments allow themselves to be completely bound by the decisions of their parliaments without maintaining some room for manoeuvre in international negotiations, then a break-up of Europe will be more likely than closer integration." Excuse us? An unelected technocrat instructing national governments to ignore their parliaments? Whatever Monti tried to achieve with these remarks, it didn't work. And he has already experienced a backlash in Germany, where if anything, there's close to a cross-party concensus over the need for giving the Bundestag more oversight not less, in the wake of the eurozone crisis and the multi-billion euro bailouts. The various rulings handed down by the German Constitutional Court during the eurozone crisis, demanding a stronger role for the Bundestag, also shows how Monti is messing with some pretty fundamental democratic settlements (see here, here, here and here). "Parliamentary control over European policy is out of any discussion. We need to reinforce, not weaken, democratic legitimacy in Europe." "The greed for German taxpayer money is blossoming in undemocratic ways with Mr Monti...We Germans will not be prepared to eliminate democracy in order to finance Italian debts." "The acceptance of the euro and its rescue is strengthened through national parliaments and not weakened." "The European Commission respects the competences of national parliaments." "I just wanted to stress the need to maintain a continuous and systematic dialogue between [national] governments and parliaments, in order to make steps forward in the process of European integration." 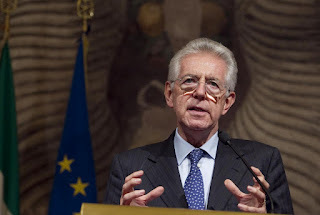 But Monti's remarks give testament to a most concerning elitist mentality, which has all too often been evident in the history of European integration: democratic scrutiny is a nuisance that should be avoided wherever possible. If he thinks that the Europe that emerges from the eurozone crisis can be built on backroom deals struck between a handful of EU leaders, under the radar of national parliamentary scrutiny, he may be in for some very unpleasant surprises. Continuing down that road will result in the rise and rise of some seriously populist, anti-EU parties as voters look for alternatives. The baby will have been thrown out with the bathwater. National democracy is not only a matter of principle but also serves a practical purpose: actions and policies that enjoy democratic legitimacy have a far greater chance of standing the test of time. Therefore, national parliaments are not the problem in the eurozone crisis, they are a big part of the solution to it. Ironically, as he struggles to push reform measures thorugh his own parliament, Monti may soon realise just how wide of the mark his comments were. You have to remember that Monti has emerged from the bureaucracy of the EU, where the emphasis has always been on deceit, on hiding of agendas, of sliding things past people that they would never agree with if they knew what is being foist on them. These very special experts, most of whom have never had a job other than that of deceiving people, have driven the EU to where it is now: poverty, squalor, youth unemployment on a massive scale. If we do not get rid of them soon, there will be civil war. No surprise surely, the European "elite" believe that democracy does not apply. This is reinforced whenever the budget comes up, although individual countries are applying austerity at different rates Europe wants more, more than inflation, more than we can afford. I am delighted to agree wholeheartedly - for once - with your Blog, its support for the democratic process and its (long overdue) recognition that in large part what has gone on for a very long time within the EU has been the negation of democracy, indeed utter contempt for democratic principles. As for example when Ted Heath was asked at least 25 years ago on TV whether the EU was democratic he looked surprised and replied "Of course not! It's far too big for that!" And by his manner and his subsequent remark "I don't understand why ordinary people bother their heads about these things, why don't they leave it to the politicians?" he confirmed that he was entirely happy with doing away with democracy. Where I have to disagree with you - emphatically - however is in relation to your headline ""National parliaments hold the keys to future European integration" which should have read "National parliaments hold the keys to future European DISintegration". If indeed national parliaments want democracy to continue, and want the wishes of their people to be respected, they can only achieve that by destroying the EU which, as we can now see with its imposed "technocrat" Prime Ministers and Mrs Merkel apparently believing that Germany can impose its will on all other European countries (sounds familiar?) has no intention whatever of respecting democracy in the longer term even if it is forced to pretend it does for tactical reasons now. I am also concerned that, reading between the lines of your Blog and its support for democracy, I still see your continued support for the EU and our membership of it, when what you and anyone else who both understands and wants democracy should surely be doing is shouting from the rooftops that we have to get out while we still have the democratic means - repealing the ECA 1972 unilateriy - to do so. When is Open Europe going to come to its senses and campaign not for a slightly less bad EU, but for a free, independent and Sovereign Britain? 1. It will not happen. Parliaments are not going to gove rights up for Italy. 2. Anyway it can not happen. Technically all sort of legal requirements have to be met. Which will take years to do. 3. Who will make in public clear where the room in negotiating is to the other side of the table. Nobody. 4. So it only is bad PR, very bad PR: undemocratic, sounds anti-German. Confirms all negatives: undemocratic, backroom-decisions, dodgy Southener wanting our money stuff. And at the wrong time. German public opinion is hardly pro-bail out at the moment and looked to had have enough of all sorts of accusations by Southeners about fourth Reichs and seeing pictures of Ms merkel with small moustaches (although I have to admit they look good, really natural, on her). He has said it a bit more cautious but should have known that this would come out of it. Huge negative. It seems we are all in agreement about the crassness of Monti so no more needs to be said oin that sacore. I must. however reinforce Idris Francis's criticism of Open Europe's attitude to the EWU as a whole. OE spends much time, much effort annd devotes majior resources to providing valuable, usable facts on the monster that The European Economic Community has morphed into. The sooner it crashes and disintegrates the better long term future the peoples of Europe will have, after a painful realignment.. The Euro is a catastrophe and the EU's all-pervasive bureaucracy meddles down to the tiniest details of life and strangles all initiative . The only beneficiaries are the eurocrats themselves - just like Montti has prospered and now preens himself as the supreme power in Italy without the slightest suggestion of democratic approval. .
Monti is a eurofanatic and so of course he couldn't give two hoots about democracy, at the either the real national or sub-national levels or the erzatz transnational EU level; if he did genuinely care about democracy he couldn't even be pro-EU, let alone fanatically so, could he? By definition, those who have given the matter any thought and who still support the EU are the enemies of democracy. Install a EU Dictator = Problem "solved". Do not knock Open Europe too hard. They have a lot of influence simply because the do not reject the EU but only want to improve it. If we are in the EU (which I never voted for), it is hard to argue that it should not be improved. Of course it cannot be improved because of the inbuilt stupidities and because of the privileges they award themselves. but making argument to improve does show up the problems. I hardly read one OE report without shock and horror. The skullduggery in this tactic will be obvious to anyone who has read "The Great Deception" by Christopher Brooker and Richard North, as I suggested in a previous reply.. I repeat that I have no connection with the authors and publisher. And I don't get any commission. Monti desperate to have Germany pay Italy's debts. Thanks, Christina, pleased you agree. As you and others may have noticed, I prefer to write plainly and have no time for pretence or ambiguity. For that reason I do not seek to do what Rollo seems to approve of, at least to an extent - to moderate my objections to the EU in the hope of a more sympathetic hearing from the waverers and the "yes, but on the other hand... " brigade. It has been my unequivocal view for 20 years, since Maastricht and the 48 hour week (when I was working 80)that the EU will bring the economies of Europe to their knees just as surely - though more slowly until now - as previous attempts did. For that reasons I have believed with a passion that the only rational thing to do is to quit while we still can, without having to fight a war to do it. It has been my considered opinion for at least six years, as patterns of opinion and EU encroachment developed, that the most dangerous obstacles to recovering our freedom and indepence,are no longer the mad Europhiles and euro enthusiasts and their camp followers, but those who STILL pretend that there is some 3rd way (for lack of a better phrase) between total subjugation to the EU as an island colony - or rarher as 12 Regions - and freedom, There is not, it is not on offer and never will be and it is high time OE and everyone else who claims to believe in the future of Britain and our economic success, to stop pretending there is, and instead start telling the truth - that we either leave and succeed as a free country, and we stay and perish as a colony. Ruth Lea, who after she had delivered the mid 1990's IoD headline speech to the Congress for Democracy, was barracked to such an extent for saying that we must stay in that she had to point our that what she had said was the (then) official view of the IoD and not necessarily her own. Shortly afterwards when by chance we shared a coffee table during the break and I asked her how it could be that so many leading players seemed not to understand that we have to leave, she surprised me by replying that they realised it perfectly well, but that it was not yet time to say so. She at least doea now say so, plainly and clearlt, and is I believe a supporter of Better Off Out. Within the last year she has rederred to those who claim that there is some half-in, half-out option available as "deluaional" and she is right, at least about those who really believe that nonsense. and prosperity of everyone in Europe - and those of us in these islands who are not. Why does anyone still listen to these self-declared Eurofascists? Their agenda has been made crystal clear: Global Government headed up by them and people like them. Thus, anything they say must be received in that light. The last thing they care about is "fixing Europe" or making life easier for people. They are fascistic ideologues who would happily eat their young if it meant advancing their ideology an inch. In my opinion Italy should take care of itself instead of biting the hands that feeds it. Monti should know better. No need to defame him as a technocrat. Italy could sell South-Tyrol back to Austria, non-Italian territory seized by the shameful Versailles Treaty, as a reward for disloyalty of the Italian nation. The Brenner border is still a deep disgrace.